As always, you never have to worry about us clogging your inbox, I only send out newsletters when there’s something to put in them. That’s no more than quarterly. And you’ll never see me plugging a product or service I can’t fully endorse. 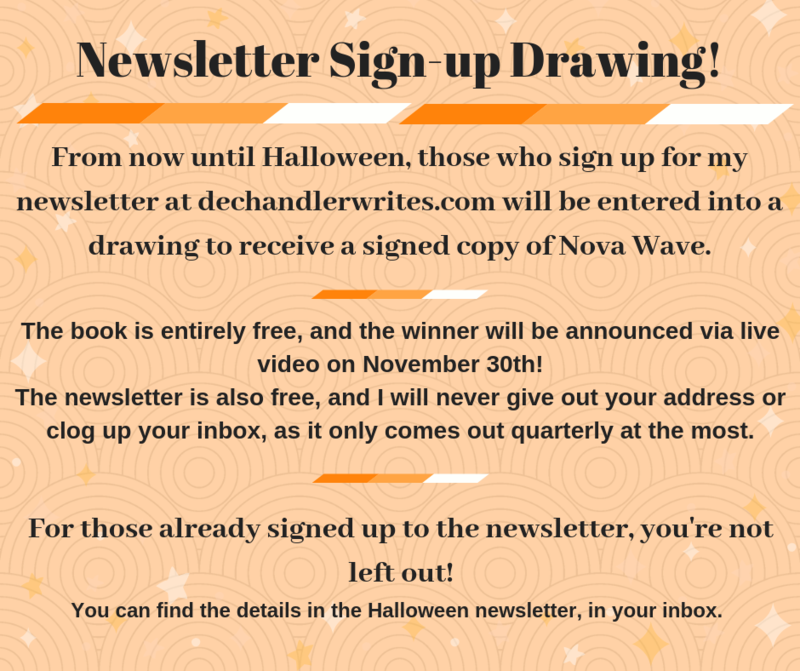 Anyway, you could win a free (No shipping or anything) signed copy of Nova Wave when you sign up now through Halloween. And, even if you miss this drawing, signing up will help you see new contests and get the low-down on upcoming events and projects. 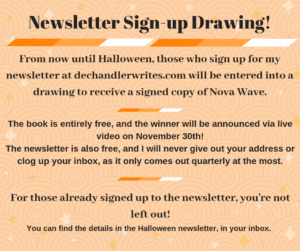 If you’re already a loyal newsletter reader, you will find instructions on how to enter that drawing in the Halloween newsletter, which should be in your inbox now. I’ll be announcing the winners of both of my drawings, (there’s one for those already signed up as well) on November 30th, 2018, on live video. Stay tuned here and on Facebook for more details on the live feed. Still trying to decide between Facebook live and YouTube. If you have an opinion, let me know! Thank you so much for sticking around during the rocky beginnings. It means the world to me. Next PostSteam Con Double Release!